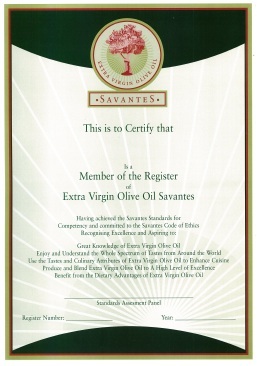 International Olive Oil Savantes is one of the few organisations that reward individuals for demonstrating their expertise in tasting olive oils. The award of Extra Virgin Olive Oil Savante and Membership of the Savantes Register is bestowed on programme participants who achieve the required score in the ‘Testing Your Skill as a Taster’ session on the third day of the current programme or during Savantes co-organised National Team Tasting Championships. The ‘Skills Test’ involves identifying different styles of olive oils, detecting defects, ranking intensities and naming the countries that produce selected varietals. In every event the integrity of the test is validated overseen by accredited representatives of Savantes. Once a taster achieves either of the two levels of recognition it is retained and will only be deregistered if the taster fails to uphold the Savantes Code of Ethics. Certificates are presented to Savantes and Associate Savantes and can be displayed as testament to taster’s ability assessed by a third independent party. This recognition is especially valuable to producers and resellers of extra virgin olive oils, as well as food industry commentators. Tasters who are part of International Olive Council (IOC) accredited organoleptic panels and regional panels are recognised for their collective contribution to a panel, mainly based on their skill at detecting defects in the classification of olive oils. However, individual ability is not accredited by the IOC panel system. Savantes recognition goes a step further by recognising individual’s fault detection ability with the added challenge of identifying the growing region from which oils emanate. This requires a broad knowledge of the taste characteristics of varieties grown worldwide, and their contribution to blends. Tasters who achieve a score of 24/30 in the skills test are awarded Savante status and become members of the Register. Achieving this score requires excellent tasting ability and a knowledge of the classic varietals produced in the main producing regions in the world.